Carrots Daucus carota, ‘bee’s nest plant’, bishop’s lace. 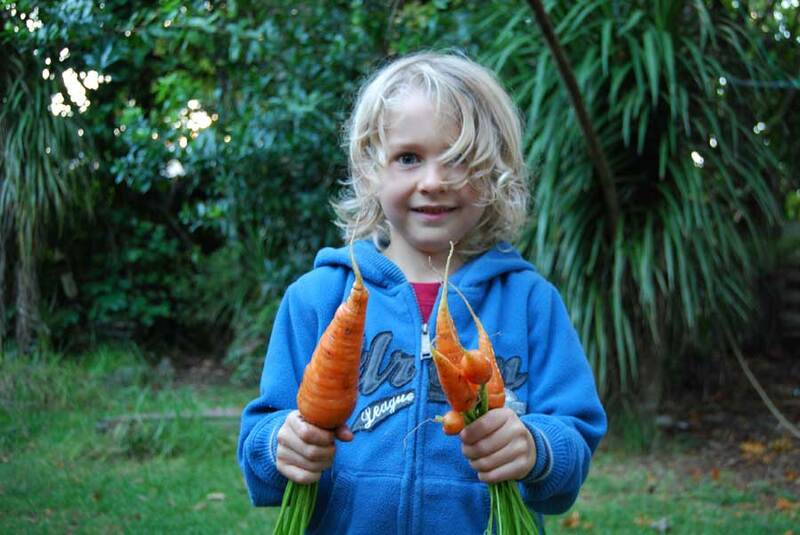 Carrots are a vegetable we eat a great deal of and the kids and dogs scrunch through them whenever they are ready in the garden. Growing your own succulent, juicy carrots gives you the opportunity to turn your taste buds onto one of the sweetest vegetables out there. When it comes to nutrition, carrots are worth their weight in gold – carrying a mother lode of anti-oxidants, vitamins and minerals. 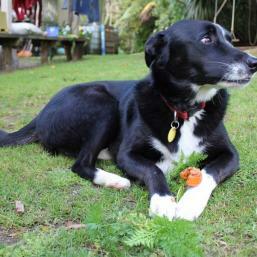 A freshly pulled carrot from the garden is a must for any lunchbox. Companions onions, leeks, lettuce, radish, tomato, pea. Quantity 1 stride length row per person. Nantes heirloom variety grows quickly to produce cylindrical rich orange roots with sweet flavour. Great raw. Nutri Red heirloom variety with reddish orange colour and strong flavour. High levels of lycopene. Good for cooking with. White Belgian heirloom variety for those seeking something different. Green shoulders on slender white roots. Sweet and tasty. 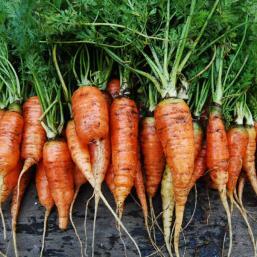 White Belgian open pollinated variety produces mini carrots, just over a finger long, sweet and tender. Touchon heirloom variety with long coreless roots – a good hand’s length. Sweet, great raw and for juicing. 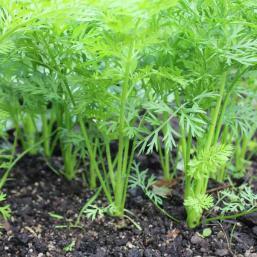 Carrots like a place in the sun but they will handle some diffused sunlight too. 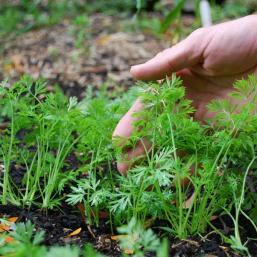 They grow well alongside onions and garlic – the smell of which is said to deter pests such as carrot root fly. 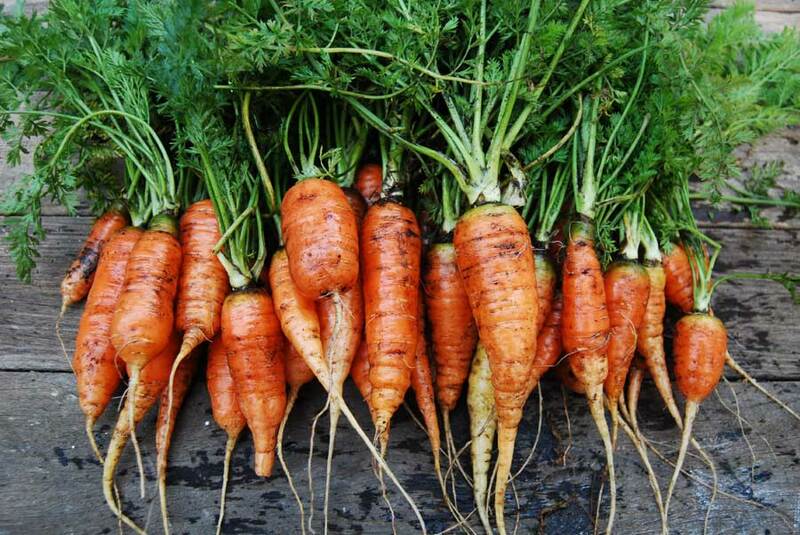 Like other root vegetables, carrots grow best in a fine, well-dug soil that is generally lump-free – at least to a hand’s-depth. 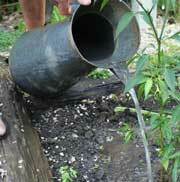 (Ideal for those with raised beds or sandy soil)). 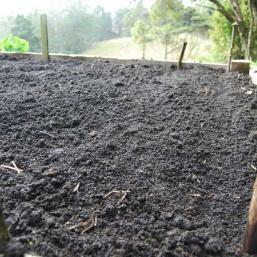 A fine, loose soil allows their roots to grow evenly as they penetrate the soil and then swell to juicy perfection. 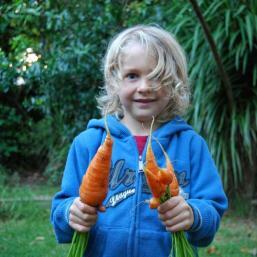 Then again, the odd lump or two can produce some fairly weird-shaped roots that keep our kids amused at the kitchen table… On the whole though try and provide a soil that you can pretty much run your hand through – with a bit of effort. 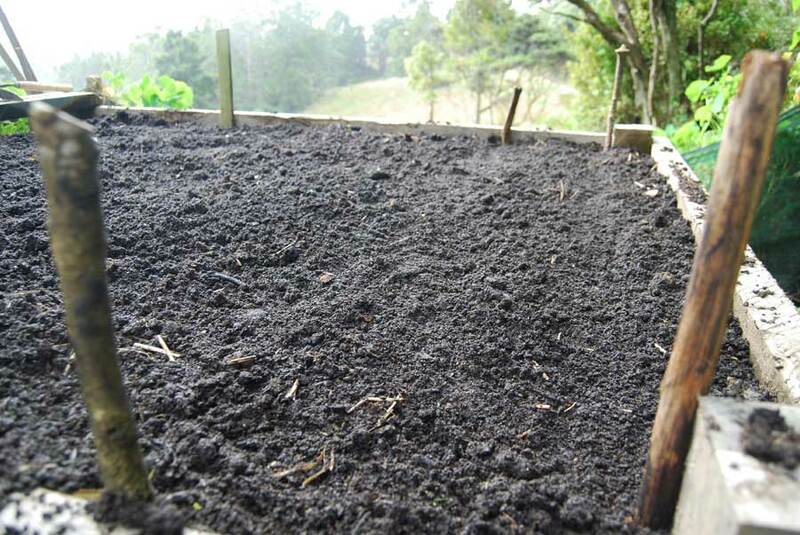 Soil should have a few goodies stored in it – well-rotted manure or compost – that have been well incorporated, maybe even left-over from previous plantings last summer. 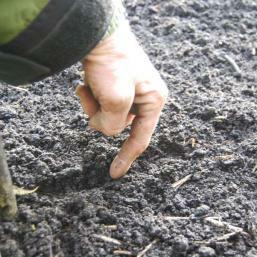 Rake soil level and gently compact with the back of a rake – it is best to do this in dry weather if possible. If weather is not playing the game you can buy a sack of potting mix and spread that over the soil in your bed to give a nice level surface on seed sowing day. 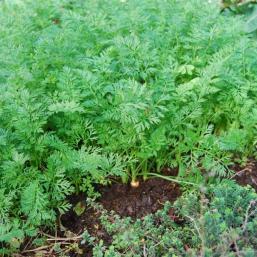 Carrots are generally best sown directly into garden beds or containers. 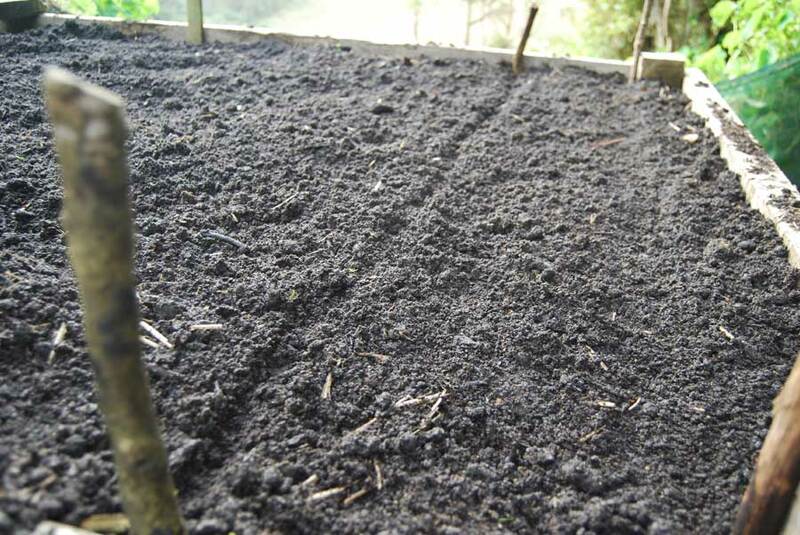 For orderly lines: Using your finger tip or a stick of similar thickness, drag a shallow ‘drill’ or trench, about a finger tip deep across the surface of well-dug soil. 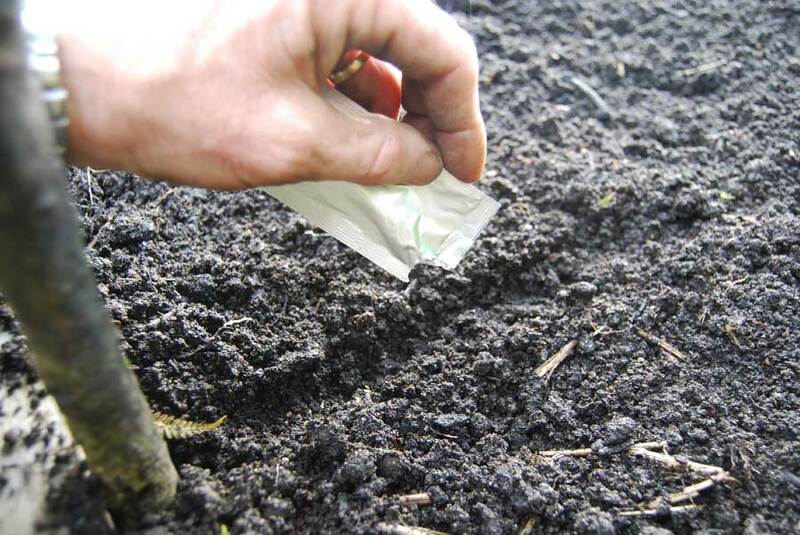 Sow the seeds into the drill at the spacings recommended on the packet – which in our case all depends on the pilot of the seed packet. I just try to make sure I can see a line of seeds about a finger tip apart from each other. Don’t fret about sowing because in a few weeks’ time you’ll go through and thin seedlings to make room for roots to swell. 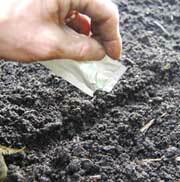 Leave a gap of around a finger length between your rows and lightly firm soil back over the sown seeds. 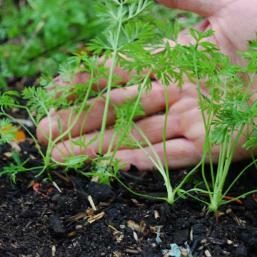 For a carrot patch: Scatter seed across an area – say a square that is maybe a forearm by a forearm wide. Brush a thin layer (about a finger tip deep) of soil/compost across the seeds so that they are no longer visible on the surface. 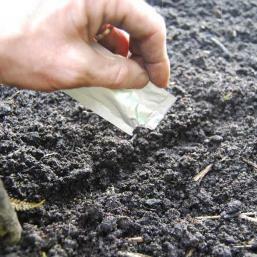 If you are sowing in spring and there is any chance of late frosts in your area then protect seeds and young seedlings with horticultural fleece draped over hoops along the rows (As long as the foliage is visible and the seedlings are showing through the soil then you should be okay to remove the fleece). You don’t have to sow all your seeds at once - to keep the kitchen crunching sow a new row or patch every two weeks to ensure a constant supply. For an all-round regular root thin seedlings down to about one per half finger-length when the foliage is about a finger length in height. 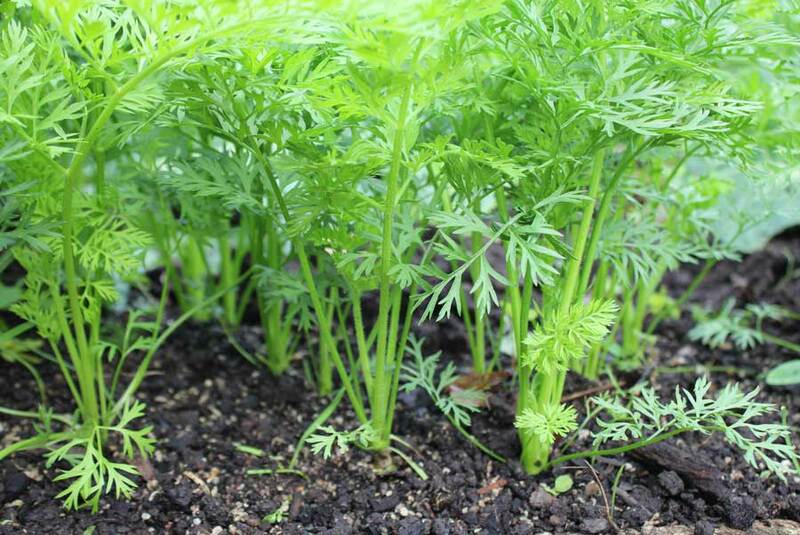 As your carrots continue to grow, thin them again so they are about a finger length apart. 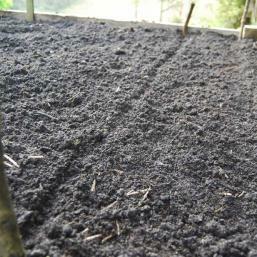 Maintain constant moisture levels to encourage nice uniform roots. 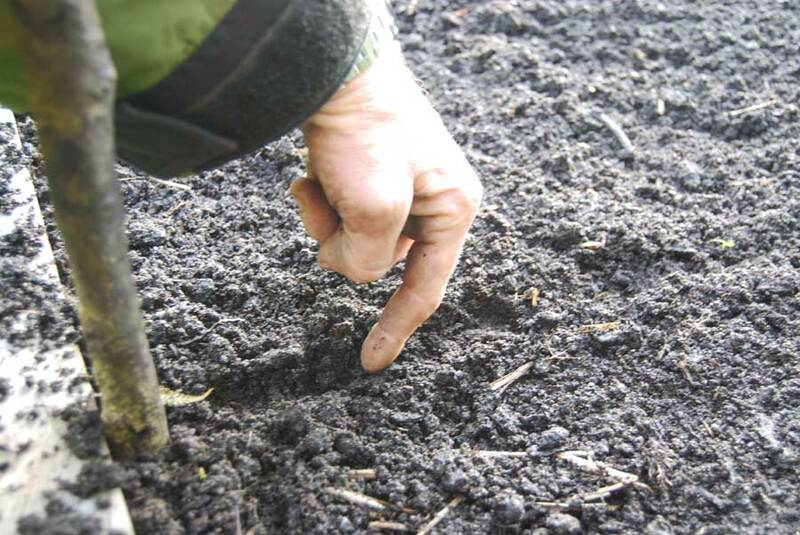 Best is to check soil moisture when the sun comes out – should be cool and damp when you push your finger beneath the surface. If not, adjust watering accordingly until it rains again. 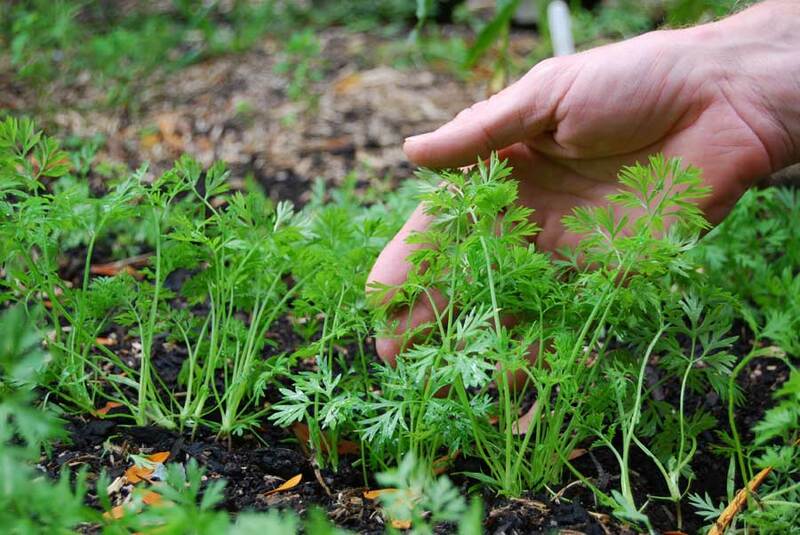 Slugs and snails are the enemy of all carrot seedlings and should be discouraged by whatever means sits well with your conscience. 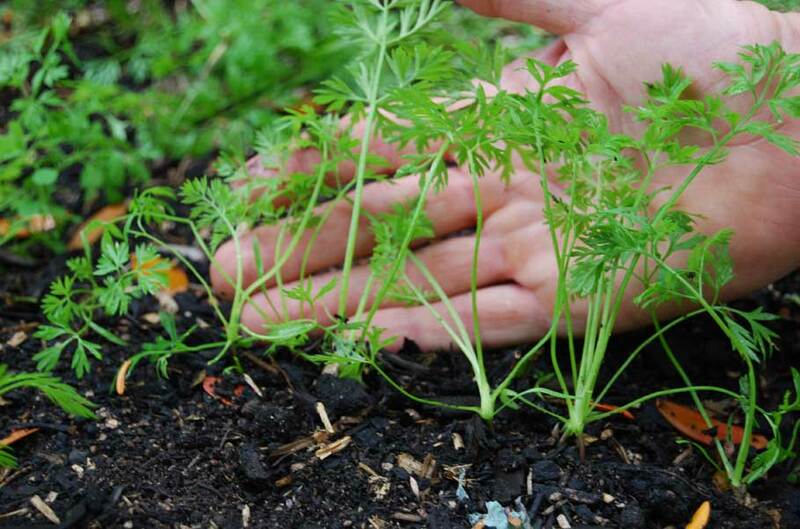 If you have a problem with slugs eating young seedlings then sow carrots in pots and old buckets or half wine barrels filled with free draining compost and drainage holes in the bottom. Carrots should then be able to grow un-molested. 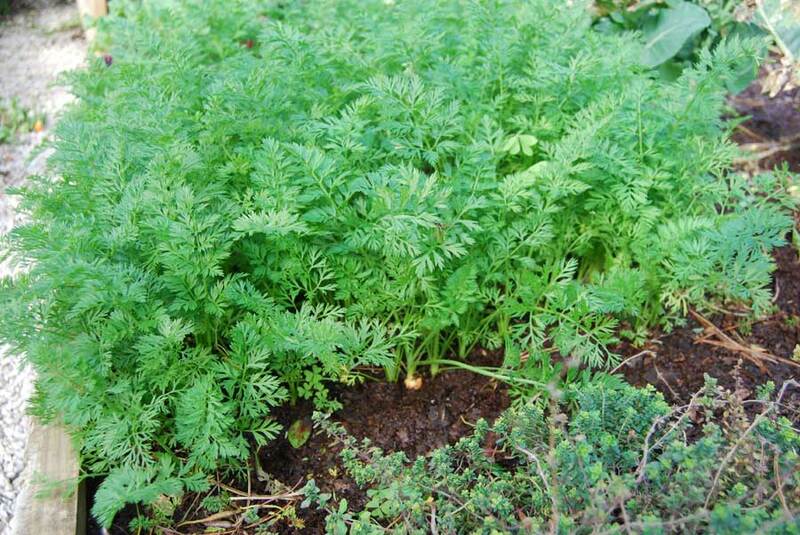 Carrots can be attacked by carrot fly that finds crops by the smell of foliage. Planting carrots alongside onions helps to confuse carrot fly. Removing all foliage after thinning and picking also prevents an obvious olfactory signal from being shouted out to any passing carrot flies on the prowl. 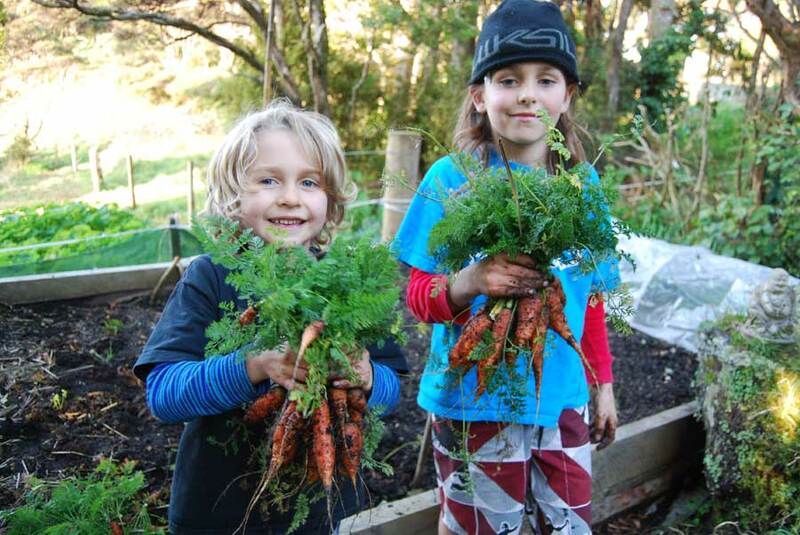 You can harvest carrots when ‘baby’ size – as part of your thinning program and then leave others to grow on until they reach show-stopping size. Ours hardly ever get to full maturity thanks to three eager young appetites and competitions to pull the biggest. 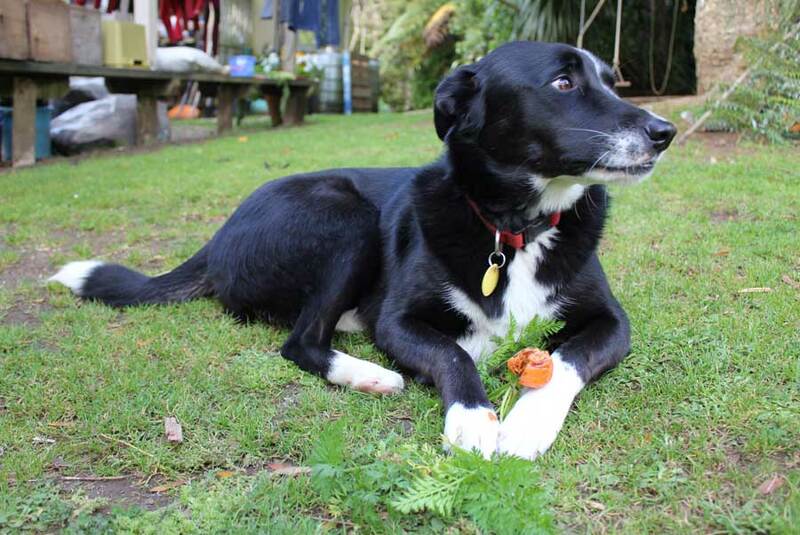 Even the dogs join in – Sula, our huntaway-collie cross has been spotted pulling her own carrots from beds and happily munching them on the lawn. Leave a few carrots to flower and they’ll attract beneficial predatory insects like hoverflies into your garden. 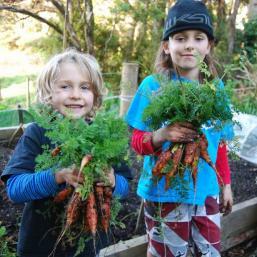 Carrots store well in the ground – but in our garden they are never allowed to hang around for long enough.